I enjoyed my ride in the beautifully redone Rolls Royce. I could not believe how much space it had inside!!! It also has speakers UNDER the car so as we were doing the champagne toast/pictures songs like "going to the chapel" were playing, everyone was really enjoying the music, he had a really great wedding playlist going the entire time. I couldnt have asked for a better driver, car or company to do my wedding ... They have always been #1, Thank you Action Limo! The drivers were early and amazing. I 100% recommend action limo. It was raining outside and the driver actually came around and carried my train for me going into the church. The professionalism is outstanding. Thank you x a million!! Action Limousine was one of the best parts of our wedding! 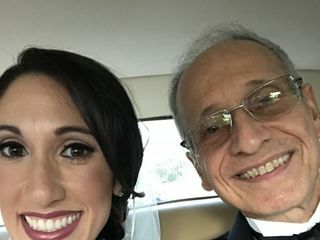 Our driver showed up 15 minutes early, helped us put our bags and cooler into the limo, and even made sure we had enough alcohol to make the hour long trip from the church to the venue! Action Limo provided an amazing service that was courteous, professional, punctual, and friendly. The limo itself was extremely clean and comfortable, and made our hour long journey enjoyable. We highly suggest you use Action Limo for your special day. You will not regret it! Loved Ray and Action Limousine! We hired AL for our wedding in Jersey City and everyone was very professional and attentive. With multiple reminders, I felt very confident that they were on top of it for our special day. Ray arrived early and texted me when he arrived. He was super helpful in helping me in and out, taking our party back while we did the first look and arrived back to wait and pick us up. Exactly what we needed, and a very friendly face to help us through different sessions of our day. Thank you! Action Limo was amazing! We were using the Rolls Royce and also a Party Bus from them. Both arrived early to the houses we were getting ready and the drivers were very professional and great to work with. They actually gave us a larger party bus then we reserved, just because they had it available that morning. They were so easy to deal with and were very knowledgeable about the church and venue we were using. Can’t say enough good things about Action Limo! I found Action Limo through my amazing band and since day one were extremely happy with the service. We had an appointment on one of the rainiest days of the year in May 2017 & even though it was absolutely disgusting outside, all of the cars were in impeccable shape ready to go out for the wedding that day. 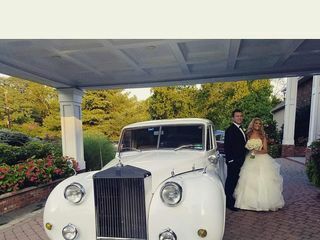 We were given a tour of the limos, party buses, and Rolls and sat in the cars & listened to wedding music like it was day of - it was such a fun day & we gave the deposit on the spot for the party bus & the Rolls. As the indecisive person I am, throughout the week I started to think that the party bus would not fit my black tie / old fashioned wedding vision & I should have gone with the limos instead - I called John up & told him everything I was feeling & he listened & completely understood. Luckily the limos were still available & we made the switch - this is when I knew I was in great hands. I ended up hiring his daughter, Michelle Perez as my wedding planner which was perfect because I was able to make payments throughout the year & confirm my schedule through Michelle & also knew that everything would go right with the transportation day of. Michelle knew my schedule and all my changes so it was perfect that she could relay all information to her dad. From May 2017 to September 2018 my schedule changed many times, the park, the church, picture location & the times & each schedule change Michelle did an awesome job of updating the cars & making sure there would be no issue day of. Day of I couldn’t be happier with the cars- they were early, sitting & waiting for the wedding party at the hotel in beautiful condition. I loved riding with my parents in the backseat of the Rolls listening to wedding music & heading to the church together. We hit a bit of traffic but John, the owner & the driver did everything possible to help everyone stay calm. When we got to the church the cars were much more than just drivers - they were extra wedding planners! 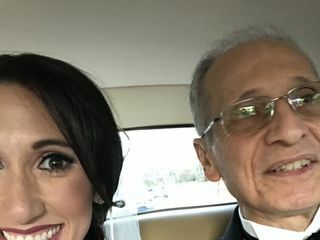 They were there with us at the church, fanned me, had a mirror so I could check what I looked like before I walked down the aisle, and fluffed my veil before my entrance with my dad - it was amazing & I love these pictures! The girls loved their limo driver & told me many times how awesome he was & that they had to get a picture with him! They said he protected them from a bee that was flying over one of the bridesmaids heads, helped them line up, gave each girl a tissue in case they cried & had a mirror so the bridesmaids could check their make up before they walked in! The guys had a blast in their limo as well! So many of the guests loved the beautiful white Rolls & were taking pictures of the car outside the church. When the guests were walking out there was champagne all set up outside the rolls and my guests mentioned this to me many times! Jimmy isn’t a champagne drinker & it made his day when John handed him a beer when we were driving in the Rolls! John was the best & had great music and conversation with us the entire way to the club! The cars were a very important part of my day - we had 4 locations .. the hotel, the church, the park & the club - traveling in, out & around a city. They were clean (even though there was rain leading up to my day), organized, on top of everything & did much more than just drive us from point A to point B. Would definitely recommend Action Limo - John & his team are great! We were very pleased working with Action Limo to provide transportation services at our October wedding! The team was very responsive throughout the entire process, and helped us think through various scenarios for providing transportation to our guests and come up with a timeline, They were also very reasonably priced, especially compared with other vendors. Our driver was amazing and the cars were clean! 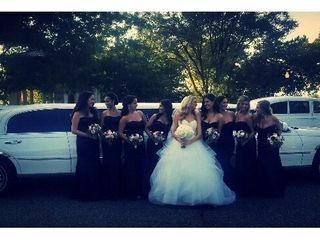 We would highly recommend working with Action Limo for your wedding transportation needs! Great service and very pleasant from the initial communication. John and his team are fantastic! 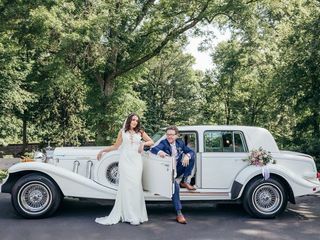 We recently used Action Limo for our wedding, we had the Rolls Royce and a stretch Lincoln Navigator, both cars were in prestige condition, the drivers were fantastic! We could not have asked for anything more! John from Action Limousine was outstanding from start to finish. He allowed my family and I to come take a look at his show room before booking with them, which was settling to see the options to choose from. I ended up booking two limos and then the classic rolls royce which is the nicest I've seen in the area! In addition, on our wedding day John and his team were very prompt. He went above and beyond making me feel at ease as we were running a little late. I forgot my veil at the hotel and he was flexible in turning around and getting me there & back as quick as he could. He is more than just transportation as he had little things a bride is in need of on her day! Super helpful and great personality as well! My wedding was yesterday and Bradley was our driver. Bradley was amazing!!! He was very polite, helpful and professional! He had tissues and mints at the ready. He was even in the church helping to fluff my dress and making sure I was looking my best. Thank you and Bradley and Action Limo for a great wedding day!! John with Action Limo was an incredible help for our wedding. His limo and Rolls were both clean, comfortable, and affordable for shuttling me, my wife, and bridal party to the church and reception. We all had an enjoyable ride. Having the comfort and additional photos with the Rolls Royce is an additional nice touch. Aside from this, he and his team provided such excellent customer service that very few can compete with. He has many years of experience in the business, and with that comes the knowledge of just about every venue/town/road in New Jersey. Throughout our wedding planning process, he was able to provide advice on coordination of our vendors, logistics, locations for photos, etc. He was a great asset to have when we needed someone to talk to. Lastly, and most importantly, we were unfortunate enough to have the heavens unleash a tsunami immediately after our church service. John and his limo driver escorted every one of our bridal party members to the limo in the downpouring rain. They were soaked, but all of our guests were dry. It was such a nice gesture that we truly are thankful for. My wedding isn't until next July, but I wanted to write a review today. I visited about 5 different limo companies, and John from Action Limo was the only one who greeted me by name and remembered the details about my wedding for the first time meeting him. Every other place didn't even know who I was even though I booked an appointment and spoke to them on the phone. To be honest, I was a little hesitant because there were mixed reviews. Whenever I go on wedding wire, I always pick the lowest ratings and want to read those first. The negative reviews that were said about Action Limo, John specifically, can't be true. John spent a full hour with me talking about my wedding and just 'shooting the breeze'. He is extremely passionate about what he does for a living and it shows when you meet with him. He is a straight shooter and maybe that's what rubbed some clients the wrong way? However I appreciated it. He didn't try to oversell anything. He was very honest about everything, but like I said, very passionate and cares about what he does. He is the only limo company that I felt like I can completely trust in him and not have to worry the day of the wedding. On a side note, he is a little more expensive than the other companies I looked at by about 400 bucks (this is also b/c he has to travel a good hour and a half to one of my locations), but it'll be worth every penny and if you experienced what I did at the other 4 places, you would understand why I have no problem paying a little more for him. You get what you pay. I'm so happy I found him. I couldn’t recommend these guys enough!! They were incredible! We had a slight issue with the car I had originally chosen on the day - the vintage Bentley was having some issues, however without me even having to do anything, they sent an even more expensive (and exclusive) Excalibur, which was absolutely stunning. Our driver Alex was one of the nicest, most polite and welcoming guy and he really added to our special day! If you’re wanting a car company for any event, especially with a vintage flair, go with these guys. You won’t regret it. Action limo was amazing! 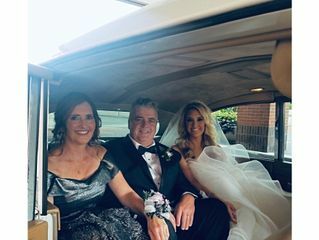 Bradley was our driver and he went above and beyond the day of our wedding! He was so polite and professional! I would definitely use Action limo again! I could have not picked a better limo company! They were extremely early to my house on my wedding day and helped everyone move their luggage into our party bus. They even helped me fix my veil before walking down the aisle (I had a cathedral veil), and open the doors to the church for my grand entrance. I couldn’t recommend a company more (I’ve been in many weddings and they were by far the most professional and easy to work with and went the extra mile). John made our special day even more special. He was very accommodating and made us feel like royalty. Highly recommend! Richie was courteous, professional and accommodating. We had a great time and would have no hesitation recommending Action Limo to anyone in the future. Great job! From the first phone call to final drop off Action Limo was incredible. The party bus was early, which means on time, and was immaculate. We had a change of address for a pickup later in the week and no problems. Any issue whether it was as little as a napkin or ice to wardrobe malfunctions and church procedures they were on top of it all. It was like having a wedding coordinator there with us all day what to do and how to do it. I can honestly say with confidence that they are the best limo company around. Our driver Joe was great, I can’t say enough about how professional and attentive to every detail he was. At the church he was telling people about car keys in their pockets, helping get organized and helping set up pictures. He really was excellent. There is only one call to make for a limo on your wedding day and it’s to Action. John you were fantastic!!!! We are so happy we chose Action Limo for our special day! You went above and beyond a typical limo service could ever do! From calming the bride, father of the bride, and groom, to having all the right necessities to make our wedding day extra special! Thank you!! The team at Action was a pleasure to work with! . Lou drove us in the Bentley and Carmen drove our wedding party in the Chrysler limo and was equally awesome. They were both so friendly and nice! The two of them even fluffed my dress and veil out as I walked down the aisle. It really shows when people enjoy what they do and this company from the owner to the drivers LOVE what they do! Thanks for making our day a memorable one! We had our wedding this past December at the Tides Estate and used Action Limo for transportation to/from the church services. 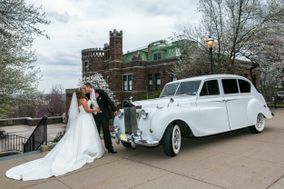 We booked the Bentley which was beautiful and made for some great wedding photos during our First look services. Our driver Lou was very personable and all around did a great job! John at Action limo was very reliable, trustworthy and also gave us a good price in comparison to the other limo services that I called. I would definitely recommend Action Limo for your next event! After calling a few different places, I was referred to action limo , and they were fantastic. Their driver doug was on time, party bus was great, and the driver was a great guy. I would highly recommend them for any of your transportation needs and I will be using them again in the future.